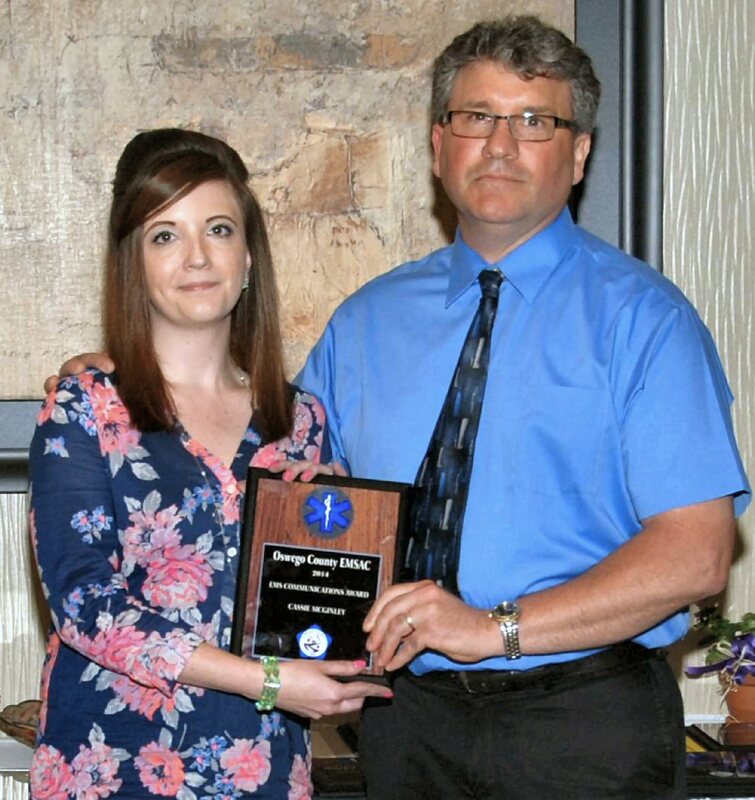 Michael Allen, director of the Oswego County E-9-1-1 Emergency Communications Department, presents Cassie McGinley the Communicator of the Year award at the Oswego County EMS awards ceremony. McGinley also received the regional EMS Communications Specialist of the Year award from Regional EMS Council President Dr. Derek R. Cooney and Vice President Brian Dahl. OSWEGO – During the six years that she’s been working as a public safety telecommunicator for the Oswego County E-9-1-1 Emergency Communications Department, Cassie McGinley has received several commendations recognizing her outstanding performance as a calltaker in the Oswego County Public Safety Center. But it’s her most recent awards, recognizing McGinley’s extraordinary actions during an incident on the afternoon of April 10, 2014, and the teamwork that allowed her to successfully work with others on the scene, that she is most proud of. McGinley answered an incoming call requesting emergency assistance for a 40-year-old woman who was unresponsive, experiencing difficulty breathing, and possibly having a seizure in the town of Richland. The patient stopped breathing during the process and lapsed into cardiac arrest. McGinley’s next actions are credited with saving the woman’s life. She immediately proceeded to follow emergency dispatch protocols by providing the caller with cardio-pulmonary resuscitation instructions while waiting for Northern Oswego County Ambulance to arrive. With McGinley on the other end of the line, the caller was able to successfully perform CPR. The patient began breathing on her own on the way to the hospital. After the incident, NOCA members contacted the E-9-1-1 Emergency Communications Department to make sure that McGinley was credited for her actions. McGinley was recently recognized as the top EMS Communications Specialist of the Year in the five-county Central New York Region, and she was named 2014 EMS Communicator of the Year by the Oswego County Emergency Medical Services Advisory Council. The EMS Communications Specialist of the Year Award is presented to a dispatcher or call taker in one of the five-county (Oswego, Onondaga, Cayuga, Tompkins and Cortland) agencies who shows dedication, responsibility, professional behavior or special skills or insight to pre-hospital communications.